ORLANDO, Fla. — Beating the Los Angeles Lakers might not be as significant an accomplishment this season as in years past. But for the Orlando Magic, who had dropped 12 of their previous 13 games, there was nothing insignificant about their 114-105 victory behind Tobias Harris’ 28 points and 20 rebounds. With the help of a season-high 38 points in the third quarter, the Magic became the 11th team in a row to score more than 100 points against the Lakers, who are 29th in the NBA in points allowed per game. Arron Afflalo, coming off a season-low six points Wednesday night in a loss to Atlanta, bounced back with 23. Jameer Nelson added 20 points, including four 3-point field goals, while Victor Oladipo finished with 15 points and 12 rebounds. 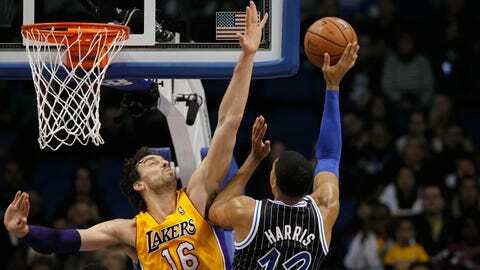 Despite getting 17 points and 13 rebounds from Harris, the Magic trailed 55-53 at halftime. The Lakers went 6 of 12 from 3-point range, the last of which came from Wesley Johnson in the closing seconds of the half. The Lakers led most of the way until the Magic went on a 13-0 run in the second quarter which included a 3-pointer by Doron Lamb and a dunk by Kyle O’Quinn off a fast break. O’Quinn wound up playing more minutes than Glen Davis, who got into foul trouble early and never regained his rhythm. O’Quinn ended up with seven points, six rebounds and two blocked shots. Pau Gasol had 21 points and 11 rebounds for the Lakers, who went 12 of 22 from 3-point range. Kendall Marshall added 19 points and 14 assists. Five of the Magic’s next six games are on the road. Down 80-77 following a 3-pointer by Marshall, the Magic outscored the Lakers 14-0 over the final 3:12 of the third quarter and never trailed again. Harris went 9 of 15 from the floor and came up just two points of tying his career high. Harris’ first 19 rebounds all came at the defensive end. The franchise single-game record for defensive rebounds is 21, set by Dwight Howard against the Miami Heat in 2012. Sunday night at New Orleans, 6 p.m. (FOX Sports Florida).